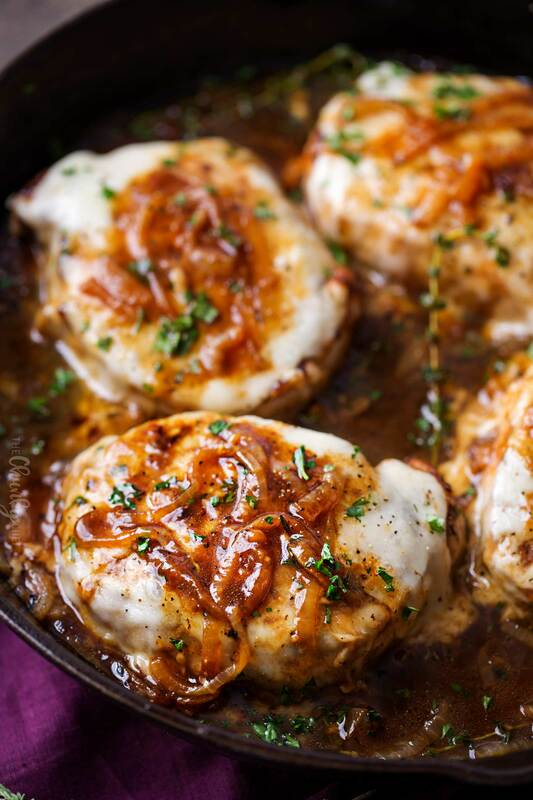 Perfect for a weeknight meal, this French onion smothered pork chops recipe is all made in one pan, and in about 30 – 40 minutes! Tired of the same old chicken recipes? Try pork instead! 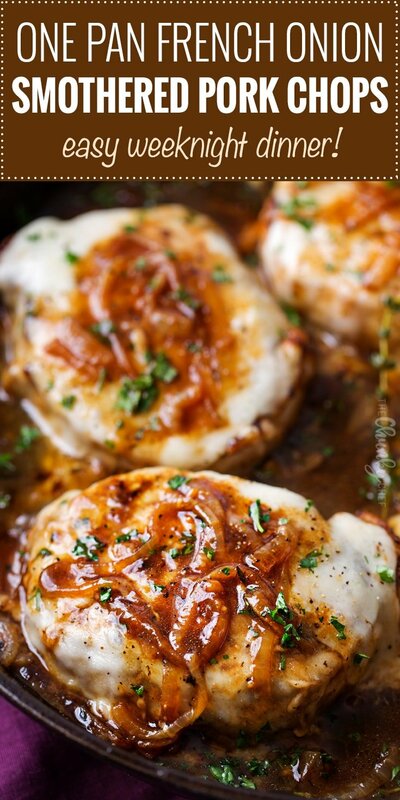 These smothered pork chops have all the great flavors of a French onion soup, plus juicy pork chops, are made in one pan, and ready in 40 minutes or less! 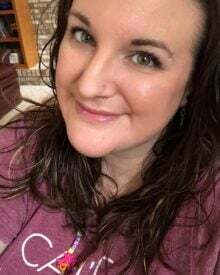 Okay you guys… I have been dying to share this post with you! You know my new infatuation with one pan/one pot meals… well here’s another one! This one is a little different though, no pasta this time. 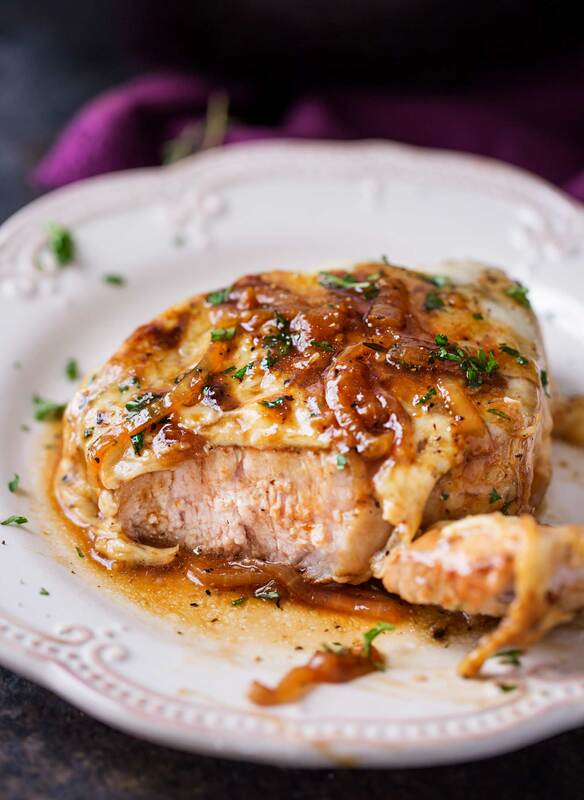 If you like French onion soup, you will LOVE this smothered pork chops recipe. Seriously! My husband ate the leftovers and with a mouthful of food, proclaimed that these were amazing. 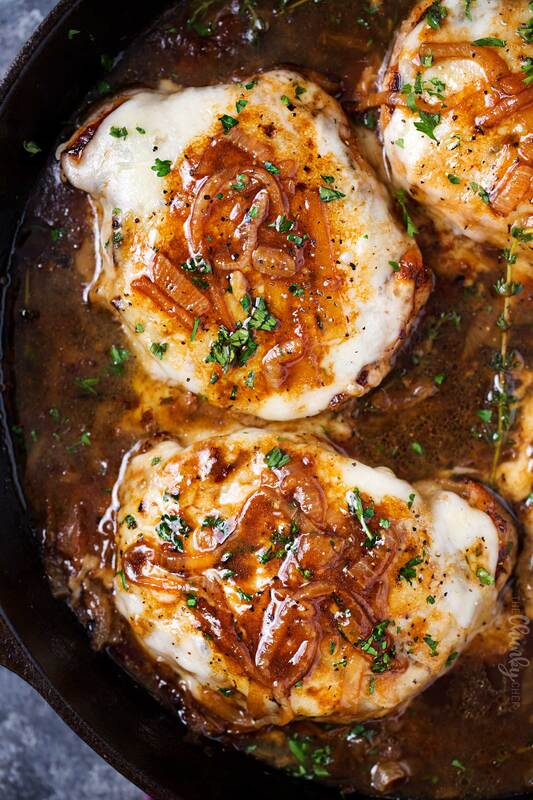 It’s savory, it’s gooey, it’s rich, it’s easy, and it’s all done in one pan! For this recipe to be truly one pan, you’ll need an oven-safe skillet, like a cast iron pan. BUT I DON’T HAVE ONE! No worries! You can absolutely make this recipe without one, it just won’t be a one pan meal. You’ll just prepare the recipe through step 5 (see recipe at bottom of page), then transfer it all to a 9×13 or similar sized baking pan. Still only a handful of dishes to wash, which is a win in my book! There’s my favorite part… the beefy onion sauce. Oh my word, you’ll want to eat it with a spoon! You definitely don’t want to skip caramelizing the onions with the beef stock… it gives this dish such a deep, intense flavor. I like to serve these smothered pork chops on a weeknight, when I’m most in need of a quick, easy, one pan meal; but you could EASILY serve this up to company. It looks and tastes fancy, and only you have to know how easy it truly was to make! Use the best looking pork chops you can find. I usually get mine from the butcher counter, as those are generally thicker and less fatty than the ones pre-packaged out in the store. We’re using simple ingredients here, so quality is key. When you first put the sliced onions in the skillet, it’ll look like you have WAY too many. Don’t worry, they cook down considerably. You don’t have to fully caramelize the onions, they keep cooking throughout the rest of the recipe process. You way them very soft and golden brown, not deep brown like traditional caramelized onions. 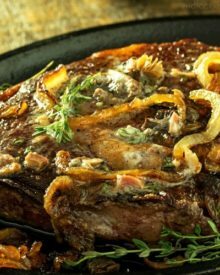 The fresh thyme sprigs are optional, but totally recommended… it’s a great flavor and really brings home more of the French onion flavor profile. Don’t worry about only cooking the pork chops a few minutes per side. They’ll keep cooking as the dish is baked later, and you really only want to cook pork to 140-145 F degrees. It should have a slight blush of pink. Pink is GOOD with pork, it means the chops will still be juicy and tender, not tough and leathery. 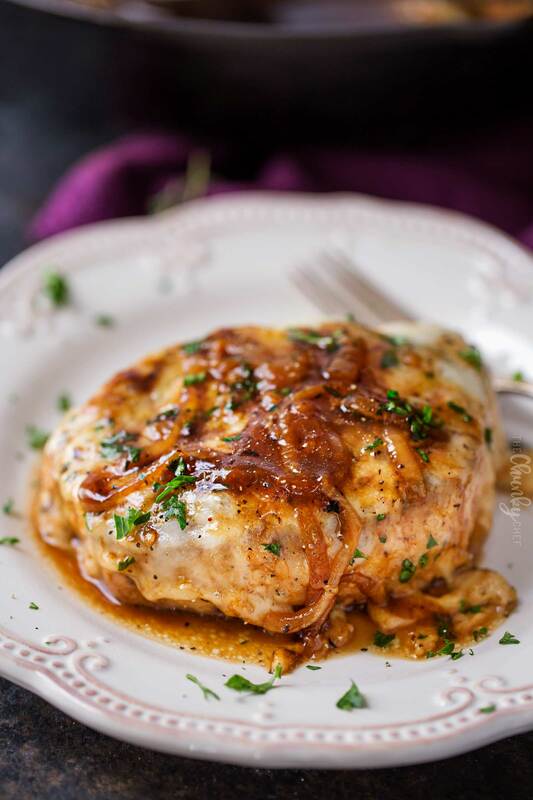 Instead of reaching for your go-to chicken recipe on a busy weeknight, try this French Onion Smothered Pork Chops recipe… I know you’ll love it! Cast Iron Skillet – hands down, the most used pan in my kitchen. Gives a fantastic sear and will give you a lifetime of great use if taken care of properly! Stainless Tongs – Perfect for transferring and flipping pork chops. Meat Thermometer – Never have to guess what the temperature of the meat is again! This probe goes in the oven with the meat while the display sits on your counter. 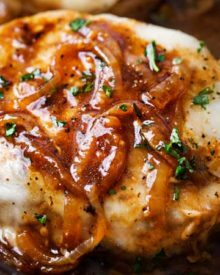 Perfect for a weeknight meal, this French onion smothered pork chops recipe is all made in one pan, and in about 30 - 40 minutes! Preheat oven to 400 F degrees. Melt butter and olive oil in a large cast iron or other oven safe skillet, over MED-HIGH heat. Add sliced onions and saute 3-5 minutes, until soft. Add 4 Tbsp beef stock and continue to cook, stirring occasionally, for 12-15 minutes, until onions are extremely tender and golden brown. As onions are sautéing, season both sides of pork chops with salt, black pepper, thyme and garlic powder. Transfer onions to a plate, do not wipe out skillet. Reduce heat to MED, add a drizzle of olive oil to the skillet if needed, and cook pork chops, about 3-4 minutes per side, until golden brown.Transfer pork chops to plate. Return cooked onions to pan and sprinkle with flour. Stir to coat and cook about a minute. Add remaining 1 cup beef stock and stir often until mixture comes to a boil. Season with a pinch of salt and pepper. Nestle pork chops back into the pan, spooning some of the beef stock over the tops of the chops. Top with a slices of provolone cheese, and a mound of the shredded gruyere (about a ¼ cup on each chop). 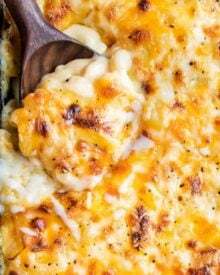 Add a few sprigs of fresh thyme and add skillet to oven and bake 8-10 minutes, until cheese is melted and gooey. Before serving, spoon some of the beef stock/onion mixture over the top of the cheese, and garnish with some additional black pepper if desired. Absolutely delicious!! New family favorite! Definitely gonna make this again!! Used my Adams artillery it was off the chain! Thanks!! I don’t have beef stock. Can I use bouillon? I haven’t tested it, but I think that should work okay. That was amazing, and easy to make. Not a bite was left! Delicious and easy! Didn’t change a thing. Highly recommend this recipe. It’s even easy enough for an “after work” meal. Loved this! I’ve made it twice now and it was a major hit each time. I do give the chops a 30 minute soak in salted water first. They stay very moist and juicy. I substitute Havarti for the provolone. Delicious! My family loved it. Served with garlic parmesan mashed potatoes and Enflish sweet peas. This is a keeper!! Question, could you use bone in pork chops with this? You could, but they’d need to bake a little longer. This recipe was so good I think we were ready to lick the plate!! This is now my favorite recipe and I cook a lot. I did deglaze the pan with some sherry after adding the onions back to the pan but before adding the flour. I served it with buttered garlic egg noodles. Thank you for sharing!! I’m definitely going to try your other recipes. Fabulous flavor! Thanks so much for posting! This was so good! I used French cut pork chops because that’s what I had in my freezer. I also used a bit more broth to make more sauce. It was amazing! Even my 10 year old loved it. Thanks for sharing the recipe! I haven’t tested the recipe that way, so I can’t guarantee the results… but you could possibly cook the onions and pork chops in the skillet, then cool them completely and refrigerate them. Then just pick back up in step 4 when you’re ready to finish. I do a similar recipe in the crock pot you prob could cook your pork chops in your crock pot with your stock on low while your at work and when you get home turn on high throw in some onions and mushroom and wait til they cook take your chops out then thicken your broth. Super YUM! I added a little red wine with the broth and it was fabulous. I served with mushroom rice, peas, and jalapeño cornbread. 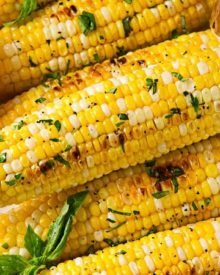 GREAT recipe that will stay in my lineup! Thanks! just cooked this for dinner. Family loved it. Used 3 sweet onions so increased broth and flour incrementally. Too hot for the oven so I just simmered it on the stovetop. Possibly used a little too much flour but it all came out delicious! 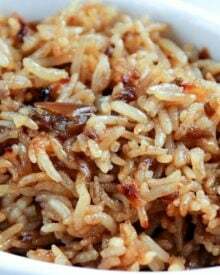 Served over rice. Also, my chops were thin sliced but the simmering made them ultra tender still. How long did you simmer the chops on stove top? 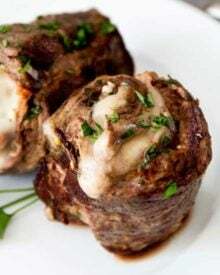 I just made these for dinner and they are so easy and delicious. They are right. 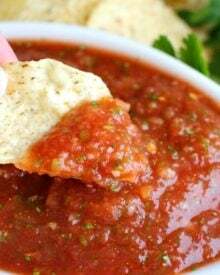 You will want to eat the sauce with a spoon! These are the best pork chops ever! Very juicy and tender, and the sauce was delicious! Definitely a keeper. Thanks for sharing this recipe. How many onions should I use to do 4 chops? Or is it purely my option? You could use more if you like, but as the recipe ingredients state, 2 onions is what I use. This looks amazing! Do you think this could be done using chicken with different cook times? This recipe is amazing! they tasted awesome and the direction were so clear and accurate and i learned a new technique for caramelizing onions. thank you! Hi I dont have a cast iron skillet. What would you recommend I do? Cook all in the pan or transfer to a pyrex dish and finish in the oven. Hi Davinia 🙂 I would complete steps 1-4 in a skillet on the stovetop, then add everything to a baking dish and bake as directed. Very good! This will definitely become one of our regular meals. Thank you for posting this recipe. Made these. They were great. So i never comment on recipes i find on Pinterest but couldn’t resist! This was EXCELLENT! Even my hubby asked to make this again! We had it with mashed potatoes and green beans and was super easy. A little time consuming but very doable for a weeknight. I especially liked using one pan for the pork which will make clean up easier! 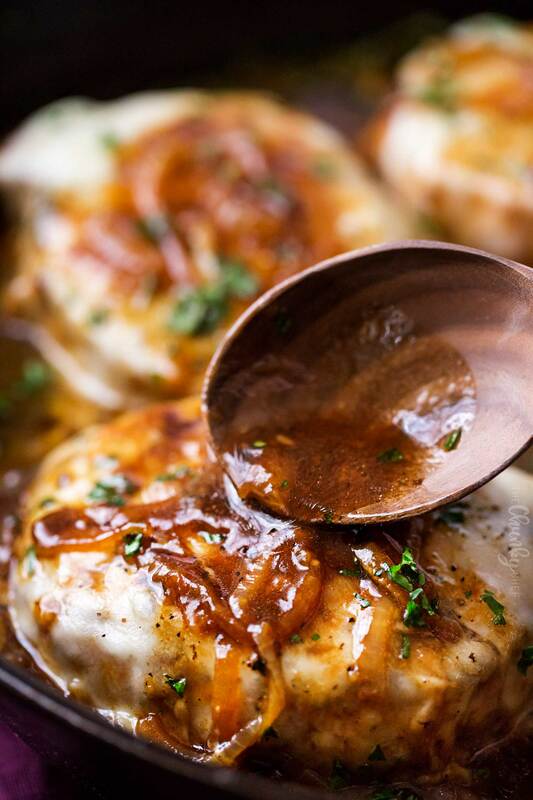 I’d love to add mushrooms to the French onion sauce for next time! Yum! Made this tonight in an electric skillet. Turned out great & was sooooo easy & good. Added mashed potatoes & green beans. It was a great meal. Has anyone tried this in an instant pot? I wonder what the cooking time would be? This was absolutely delish! I didn’t add the cheese but the gravy this made was MMMMM! And the pork chops were very tender and moist. Served with mashed potatoes and skillet fried green beans and mayonnaise rolls. Definitely a hit in our household. Absolutely will be cooking these again soon. Thanks for sharing! I wrote the recipe the way I make it… feel free to change things up if you want. But ultimately, you still have to cook both the onions and the pork, so the order doesn’t make a difference. would appreciate nutritional values on recipes. As I’m not a nutritionist and don’t want to inadvertently give incorrect information, I only provide calorie counts. Feel free to paste the recipe into your favorite nutritional calculator. These were amazing! A definite keeper! The recipe would work great with chicken too. I was mad I didn’t have any bread to mop up all that delicious sauce. Thanks so much! OMG, this recipe is one for the record !! 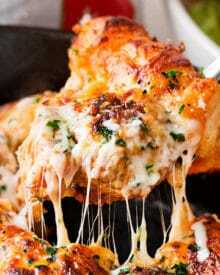 Everything came together nicely and (hold on, wiping drool from my chin :)~ Yeah, that’s drool lol) my husband made me promise to make this soon again and to not lose the recipe !!! Thank you so much for sharing !! This was DE-licious! I had to come back to comment. The pork chops were tender and juicy and the sauce with onions and cheese was just awesome. I didn’t have any Swiss so I just used double provolone, but I bet adding the Swiss would be amazing. I served it with mashed potatoes. One thing I would say, this definitely wasn’t a weeknight meal for me (especially with making the mashed potatoes). I made it on a Sunday so I had plenty of time (maybe I’m just slow?). I’ve already shared this recipe with multiple peoples and will make it again. YUM! OMG! I am not one to comment but this is a slow clap, delish meal!! Oh wow! I just had dinner and I’m drooling. These are going on this week’s menu for sure. Wow, this looks like heaven on earth…those onions. The perfect luxurious dinner! Okay this is on my list! It is absolutely gorgeous, and I love those onions! Yum! I love some good pork chops! These I must try! This dish is speaking to me. Love the french onion twist! Well, now that I have wiped the drool off my computer…THIS LOOKS AMAZING! Oh my! These look so good! I want them before bed! These look amazing! We’ve been having pork more frequently, so these are going on the menu! My husband is going to be so excited when he sees what’s for dinner tomorrow!